Place the main board in the centre of the table. Shuffle the 3 Gold cards and place them below the Morisot Banque. Reveal the top two cards, these will be the ones available to purchase. Place the 5 Gold cards face up under the Cassatt Reserve. Place the orange cost cube marked 1 in the Megan Galerie, then randomly select three other cubs and place them in the three other galleries. Place the remaining cubes above Megan Gallerie in ascending order. Then place the white cubes on the spaces matching their number next to that. Place three sets of genre tokens into the black bag (15 total) along with the black cubes. Randomly draw them and place them on the invitation spaces on the galleries. Shuffle the end game bonus cards and place one face up in each of the galleries. 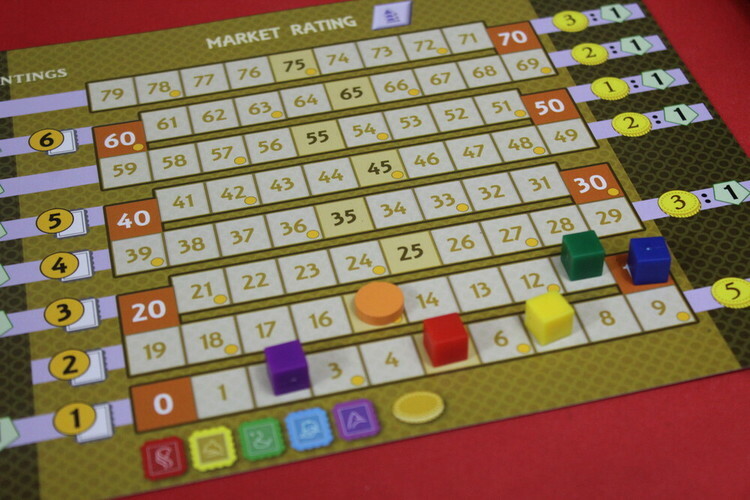 Place the market rating board next to the main board and place a set of five genre tokens and the gold disc on the zero space. 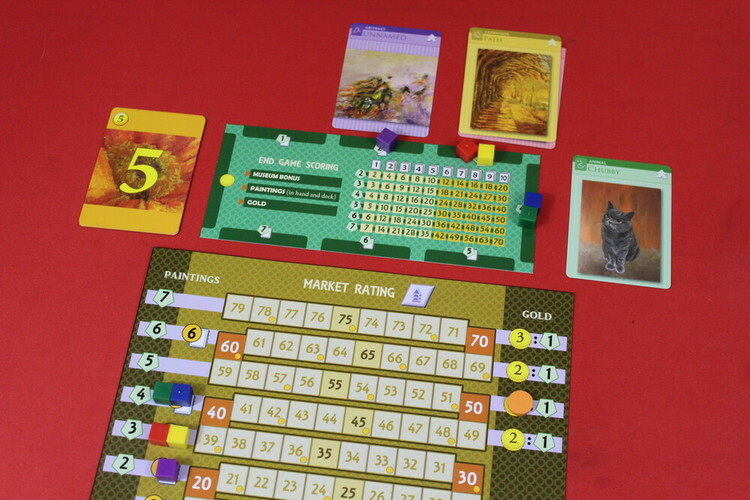 Give each player a player board, ten workers in their colour, a set of five genre tokens and a starting deck of gold cards (these are marked P1, 2, 3 and 4 in the bottom left) Each player places the five genre tokens at the one gold value space on their player board. Place a meeple of each colour at zero on the score track. 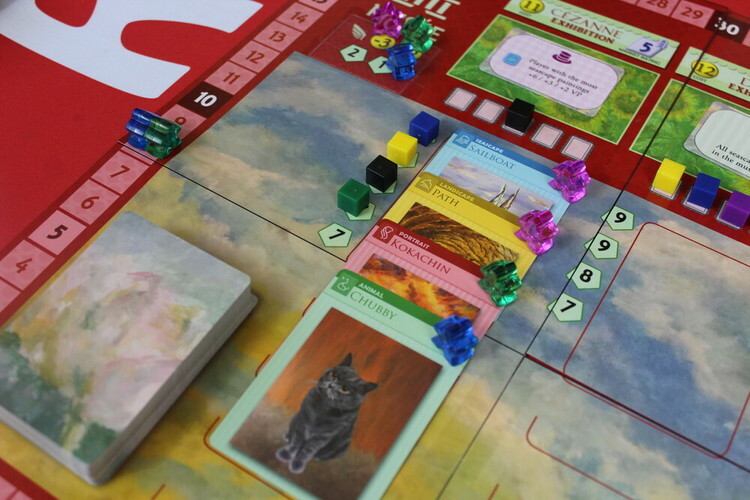 Shuffle up the painting cards and deal the indicated number into each of the gallery spaces, then deal five to each player. Each player should take some time to have a look at these before shuffling them together with their gold cards to form their deck. Draw five cards as a starting hand. 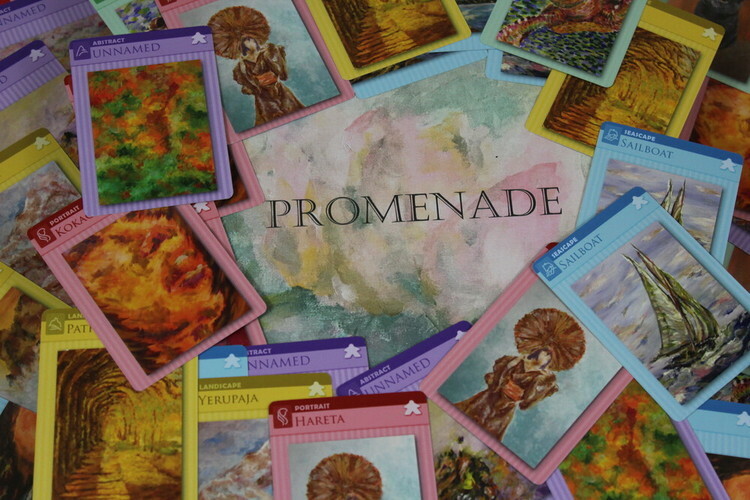 You are now ready to play Promenade! In a players turn they make take two actions from the three types of action available. They may do these in any order and may even take the same action twice. Place cards used to take an action into the action space above the player board. If at any point a players draw deck is depleted, shuffle the discard pile to form a new deck. Haggle - Spend one card from your hand and draw two cards. Choose a card from your hand and place it in one of your available action slots, then draw two cards. Acquire - Buy one card from the Promenade. Pay the cost indicated by the cube at the top of the museum you wish to buy from. Discard cards equal to or more than the cost into an action slot and take the desired card, place this into the same action slot. Advance the market rating token that matches the colour card bought by the amount shown on the gallery you just bought from. 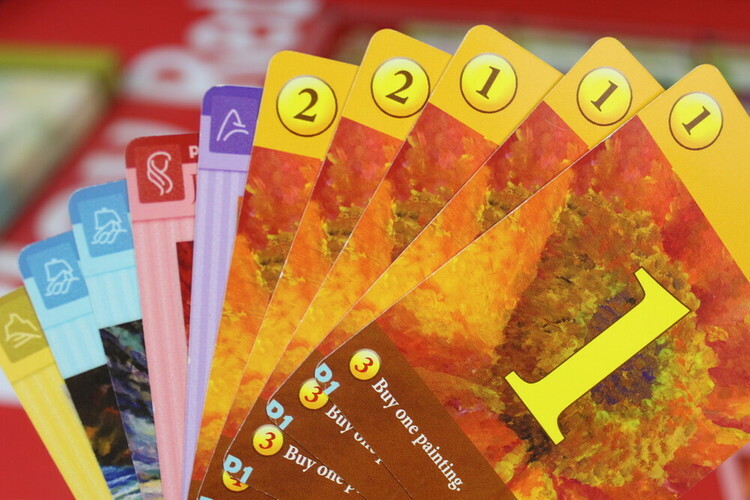 The value of paintings in a players hand is determined by the position of the matching token on the market rating track (and also on your player board - this should always match up and is just an easier way to keep track of paintings worth) Any overspent gold is lost and cannot be used. If taking two acquire actions in the same turn, paintings cannot be bought from the same location. Show - Exhibit a painting in a museum. Pay the cost shown in the museum by discarding cards into an action slot. If this is your first time displaying in a museum, claim one of the bonuses on the left of the board - this may be a coin discount on displaying or immediate points. Place a worker on the space to show it has been taken. After paying the cost, take one a painting from your hand and place it into the museum display. 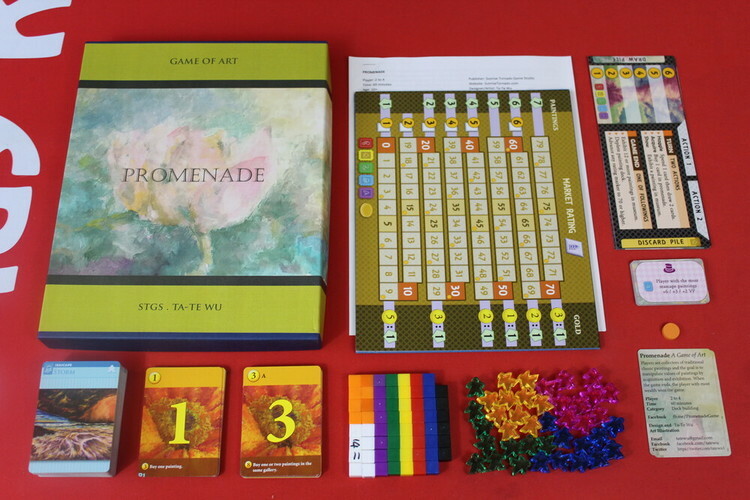 The colour must match one of the invite cubes on the exhibition (black cubes are wild) Place a meeple onto the painting you have just exhibited. Place the invite cube onto the highest point score shown and advance that many points. Advance the market rating token of the appropriate colour by the amount shown on the right of the exhibition name. Some gold cards have a special ability shown on the bottom of the card. You may remove the card from the game completely to use this ability. These abilities grant you a higher level of gold for a specific action. Remember whenever a painting is bought or displayed in a museum, the market rating of that colour (genre) of painting must be increased by the shown amount. When a marker advances to the next row and there is an increase in value, that is immediately applied to all paintings of that colour. Mark the increase on players boards. 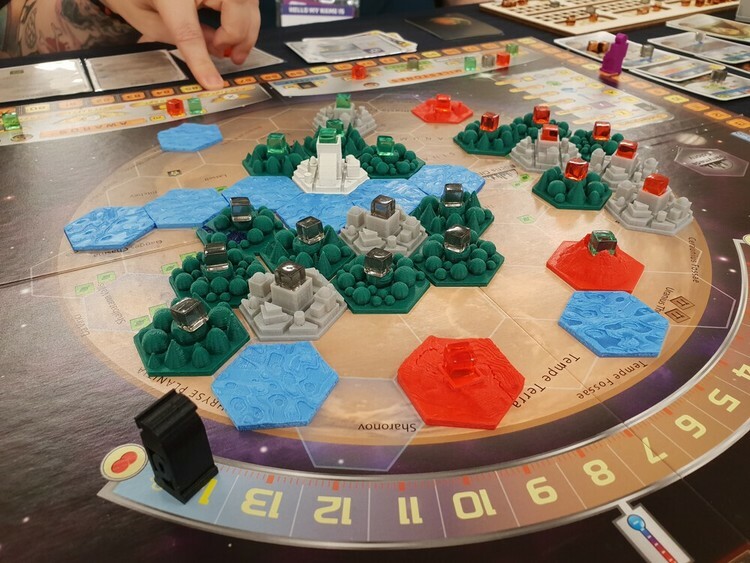 This means that a players first action could increase the value of a specific genre, meaning their hand is more valuable for their second action. Also, whenever gold cards are bought, move the gold market up on the market rating board. Three spaces for a 3 gold and six spaces for a 5 gold. This has no effect during the game but will matter when it comes to end game scoring. At the end of a turn, place all cards in the actions spaces into that players discard pile. Then, a player may discard as many cards as they want and draw back up to a hand size of five. If a gallery is now empty, remove the current cost token from it and replace it with the next highest cost cube above the galleries. Then deal cards across the rows until all galleries are back to their maximum paintings. Also, restock the 3 gold if any have been bought so there are always two cards face up. Play continues to the last player and then final scoring happens. Move all tokens on the market rating board to the green VP space on the left of the board. Move the gold token to the ratio chart on the right. This indicates how many points cards in players decks will be worth. Players can then flip their boards to use as a scoring aid. Take all cards from their hand, discard and deck and sort them into types. Place all gold cards to the left of the board. 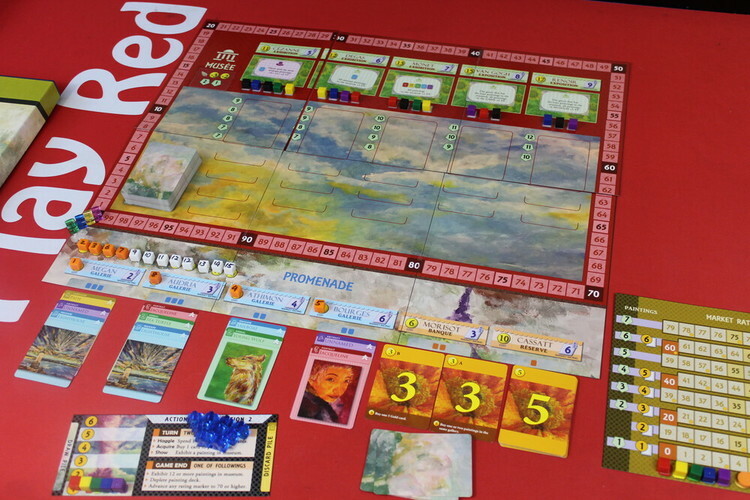 Then place paintings around the board depending on their point value as shown on the market rating board. Add up the value of players gold cards and using the gold ratio, score accordingly. For example if the gold rating is 3:1 and a player has six gold, they score two points. Score points for all paintings in a players deck according to their end position on the market rating board. 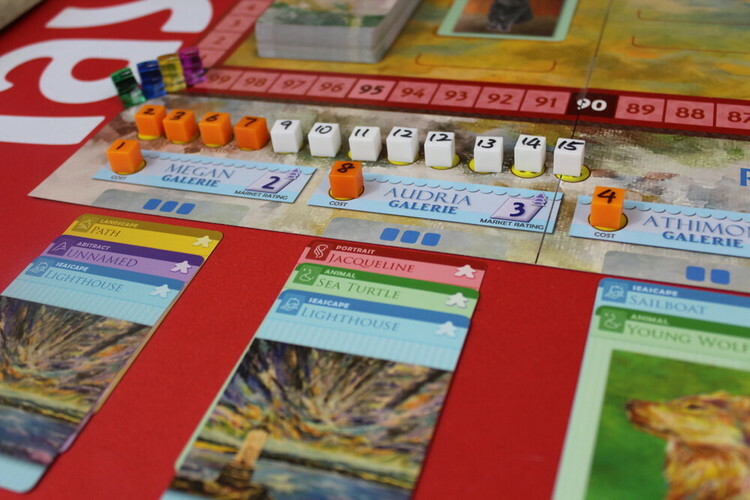 When a museum exhibition is full, the end game scoring bonus is triggered, it is possible for more than one bonus to trigger. If this is the case, score them in order of gold cards first, then green, then purple. If no museums are full, score the end game bonus for the one with the most paintings in. The player with the most points wins, in case of a tie the player with the most art in museums wins! At heart, Promenade is a deck builder but there are a lot of unique elements that make it unlike any other deck builder we’ve played. The ever increasing value of cards in your deck means it escalates quickly, yet the value of your deck then decreases when you start placing works of art into museums (which increases the value of the card you just got rid of!) The process of buying art from the galleries, increasing its value to then show in museums, along with the beautiful impressionist art style makes this an immersive experience where theme does count. The end game bonuses can make for some interesting dilemmas. If an end game bonus is points for seascape (blue) art in museums, but the museum it’s on has no blue invitations, it can be tricky to fill that museum whilst trying to get blue art on the board for example, or getting art into a museum will give you those points but trigger an end game bonus that is helpful to another player.